I haven’t shared yet what it was like to testify at the preliminary hearing connected with my brother’s murder. Probably because I’ve been trying to figure it out for myself. It was … I guess unbelievable is the best word to describe how it felt to sit about 20 feet from the man accused of killing my brother. A brother I never knew. At the risk of going all maudlin or melodramatic I need to say that I didn’t realize how much I would miss knowing John. From everything I’ve learned about him it’s easy to see we’d have connected on many levels. I believe the nerdy/geeky/sci fi gene exists! It must be in our DNA! All my brothers and my sister are smart and like sci fi, computers, etc. Loving sci fi came later in my life, but I was one of those kids in school. I was smarter than average, I wore glasses and I was uncomfortable in social situations. Total nerd or as we’re often called today, geek. Part of my testimony was to identify my mother’s handwriting and a photograph of her. I was shown a signature on John’s birth certificate and another on his adoption papers and was asked whether I could identify the signatures as hers. The surname was not one I’d known her by but I confirmed they were indeed her signature. The deputy DA then asked if I had seen her signature growing up, probably to establish that I had credibility. I assured him I had, on permission slips and report cards as well as notes for school absences. There was no doubt the signatures were hers. A little background here about the next part: Prior to my traveling to California the DA’s office had asked for photographs of my mother. I sent out a request to my brothers and sister since none of the few I had seemed useable. I received back more than 25 photos, some of which I’d never seen before. One in particular caught my attention. 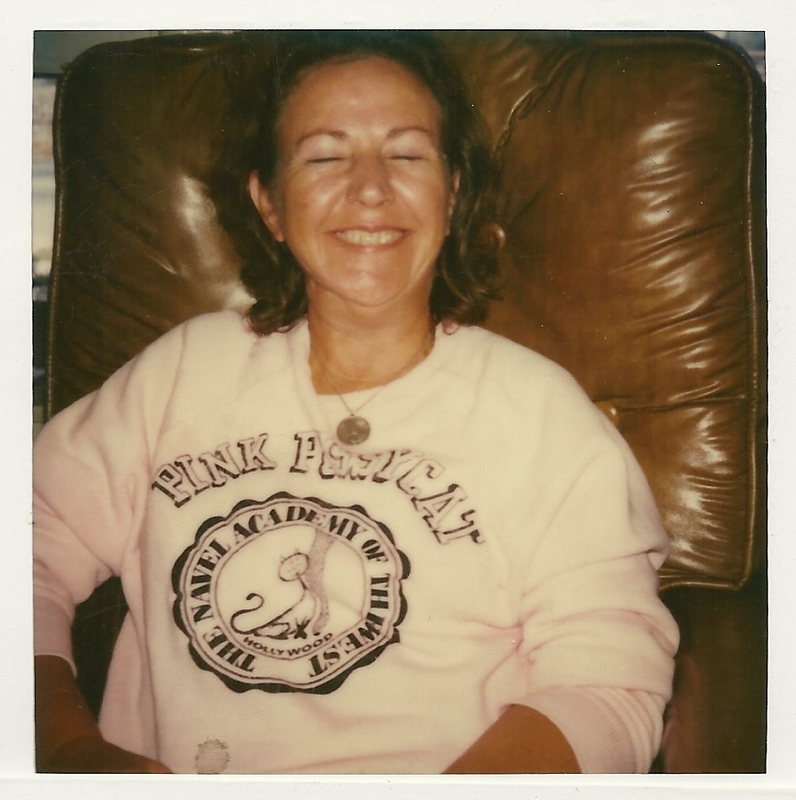 In it Mom was wearing a sweatshirt with some words on it, sitting in a what appears to be a recliner and she was beaming. B E A M I N G!! I had never, ever seen her smile like that while I was growing up. Sure, she’d smiled and laughed some but there was just something about this photo that expressed a JOY I’d never seen before. I sent that one along with another that was a little clearer. I didn’t “get” the epiphany then, only hours – maybe days later. I don’t recall exactly when I understood the feeling I had when I looked at her photo on the screen and grinned in response. It was forgiveness. Mine for her. I’d thought that I had forgiven her years ago but apparently I hadn’t truly let it go. Recognizing her joy, I was so glad that she had found that kind of happiness, and proud to claim her as my mom. I woke one morning recently out of one of those weird dreams. You’ve probably had a similarly strange dream once upon a time. First I was riding a bus with my husband. We were trying to get to a carnival but the bus didn’t stop there. Some guy climbed on, literally climbed over me to get to a seat on the other side! Next we found ourselves parked on the outskirts of town (whatever town it was) and I found myself sitting high up in the air with no way down. I’m not sure where I was but it felt like I was perched on the side of a semi trailer, only the trailer was MIA, it was just the frame. Like I said, weird. I don’t recall exactly how, but Hubs helped me down and we went inside a building I hadn’t noticed before. I remember needing to pee but not wanting to use their bathroom. I seem to recall there was a grocery store across some train tracks and I was making the case for heading over there. Suddenly I was in a swimming pool but it wasn’t your usual swimming pool. This one had stone walls, not the smooth concrete or whatever they use these days. It was dark in the water but somehow I could still see the stone walls. Someone was telling me that they couldn’t get a more accurate estimate of reaction time and I asked why. “The monkeys don’t wait for the signal,” came the answer. “The signal?” Now I was really confused. But then I saw this beak sitting on the bottom of the pool. Seriously, a beak. It was huge … much larger than a normal beak (whatever normal is beak-wise). And I saw myself reach out and press down on it just like I knew what I was doing. It quacked! Only a little peep of a quack, barely audible which I figured was due to it being under water. Movement caught my eye and I saw the monkeys, climbing up the sides of the pool. I’m not sure how I knew they were monkeys, I couldn’t make out detail in the dark water but you know how you KNOW something in a dream? I knew they were monkeys. It was about this time that I realized I too was under water and had been for some time without breathing. I started to feel panicky about needing air and swam for the surface. It seemed just out of reach and I kept thinking if I could just take a breath I’d be fine, I’d make it to the top. But I was afraid and tried to keep holding my breath while kicking toward the surface. When I finally couldn’t wait any longer and gasped for air I woke up. Wow. That last bit doesn’t take a lot of interpretation does it? Something’s making me feel smothered. Hmm. Today’s whine brought to you by: Oh My Freaking God it’s Cold!! My most recent electric bill was $150. That’s for one month y’all. One. * Granted, it’s an all electric house but we don’t do a lot of cooking and I can’t count the times I’ve come home to find the Hubs working away on his computer in a dark office. Since it’s only the two of us we don’t use the dishwasher (maybe because it’s broken, but still) and we do a whole three loads of laundry every couple of weeks. That leaves the furnace. I know it’s working because during the blackout I definitely noticed a difference without it. Maybe I should say the furnace is running. Working implies it’s actually heating the house. You might think the house is cold because we keep the thermostat at 62 trying to save money. You’d be wrong. We had it set at 70 and even 72 and I still had to bundle into blankets while watching television! They must have put newspaper in the walls for insulation. When we moved here our pellet stove went into storage; it was Spring after all. Besides, after cramming three floors worth of stuff into the space of one there was no room for it. That stove is still in storage. Damn it. Yeah, I know it wouldn’t have helped us during the blackout. Pellet stoves have augers and fans and stuff that require electricity so without a generator we’d still have been freezing. But it would help now. We could have heat and lower our electric bill. So what’s the problem? Installation. Finding a reputable installer. Finding the funds to pay said reputable installer. Finding the funds to pay for pellets. Sigh. This dilemma made me think of the 1993 movie Indecent Proposal. You know the one I mean? Robert Redford sees Demi Moore and WANTS her bad. She’s happily married to Woody Harrelson. Redford’s rich. He’ll pay the young couple $1 million if Demi will spend the night with him. In 1993 I was still in my first, not-so-happy marriage and I would have jumped on that! Now…well, no amount of money would entice me. Have you seen Redford lately? But install my pellet stove and hmm…. * I realize others may have much higher electric bills and this whine is not meant to minimize their experience. But this blog IS all about me after all 😉. So. This is how it ends. I’m going to freeze to death in my pitch black bathroom. Four days earlier I was cruising around Pasadena with my brother. The car windows were cranked ALL the way down and I was basking in the Southern California sunshine with the wind in my hair. It was probably somewhere in the upper 60s temperature-wise and the sky held no trace of the infamous smog. Perfection. Especially when home was inundated with a snowstorm so severe my office didn’t open for business. It takes a helluvalot for the Powers That Be to refuse to open the office. I was in SoCal to testify at a preliminary hearing. My part in the hearing finished earlier and we stuck around till the lunch break. Now we’d escaped the courtroom and the press, and were trying to find our way back to my hotel. I wasn’t too eager to give up the lovely ride so it didn’t phase me when we realized we were going to the wrong way and had to change direction. A few hours later we’d had lunch, met with the adopted sister of our brother and I’d been dropped at the airport two hours early. To catch a flight which was soon running two hours late damn it. I landed in Seattle in the wee hours to discover I was still dressed for sunshine and 60s while the temps there were 40s and the slush was ankle deep! Harsh awakening. Thursday the weather kept our office closed and I took pleasure in visualizing gnashing teeth in the home office. About mid-morning we lost power, not something we expected in the “city”. On our farm it was a given that we’d be without power at least once each winter, so we were a little better prepared. In the new place, not so much. I couldn’t find the oil lamps and we have only electric heat so that was going to be a challenge. But hey, we had water! Cold water, but still! Our farm was on a well, when the power failed we’d have to haul water for every damn thing. Also, we use a MagicJack so with the power out and the computers down we had no land line. Then our cell service also bit the dust and we had no way to check on other family members. The next couple of days passed in a dream-like state. We took the dogs out to find somewhere safe to walk them and to get warm in the Suburban’s rockin’ heater. Traffic lights worked in one block but not the next. Broken tree limbs were strewn everywhere; some trees were even uprooted. Fallen limbs had taken out fences, broken through roofs and littered the streets. The storm’s devastation was frightening. At night we’d huddle under a pile of comforters, both dogs and occasionally the cat adding to the body heat. We were loath to start each day because it meant climbing out of cozy warmth into frigid air. Which brings us to Sunday. Nature’s call this morning is impossible to ignore any longer and I grab a flashlight on my stumbling way to the bathroom. I manage not to scream when I come in contact with the icy seat, take care of my business and prepare to exit. The door will not open. No five words have ever sounded so loud and ominous in my head. I tried again, twisting the knob the other way. No luck. One more time I turn the knob and feel the internal workings snap free. Uh oh. Now I’m starting to freak a little and I begin yanking on the door while twisting the unresponsive knob. And cursing loud enough to wake the dead, or in this case Hubs. He calms me down and goes in search of a tool or three to take off the doorknob. I sit on the commode to wait. My flashlight is fading and I turn it off to conserve battery life. So. This is how it ends. Obviously it didn’t end that way; I’m here writing about it. I hope it made the reader smile at least. After the fact we found it pretty hilarious.